"Capt George, if customers want keepers I can handle that. Had about 120 fish today, took our limit and released the rest." Do you want some of that? Shoot me an e mail and we will get you rigged up. Capt. 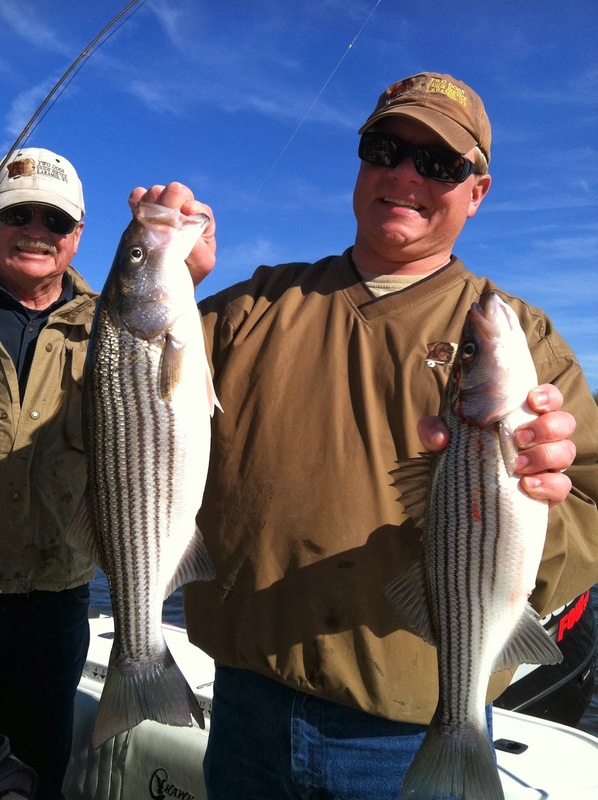 Mitch Blake and Richard Andrews are really tuned into the winter Roanoke River striper fishery. Capt. Greg has also been up there poking around. Plenty of triple digit days, cold water catch and release spin and fly rod. These guys are going to follow this huge mass of fish all the way to Weldon. The below pic is from Mitch Blake from two days ago. Thanks Mitch for taking care of our folks. After arriving in Ecuador, we spent a night in Quito, checking out the very modern city and beautiful churches. The first thing that blows you away is the excellent infrastructure such as great roads. Where does the money come from? They’ve got to have oil and $1/gallon gas confirmed that. We spent the next couple of day up in the highlands at a very remote spa/hot springs nestled in between the Andes. Snow topped volcanoes and mountain tops overlooked us riding horses and lounging in hot springs. Early morning start and we are back to Quito for our flight to the Galapagos Islands, 600 miles off the coast. By early afternoon we had arrived at our first destination, deployed the pangas and came ashore on Santa Cruz Island. Resting under a bush we encountered our first giant Galapagos tortoise and I was extremely chastised for trying to bridle it up and take a ride. Back to the boat for dinner on the boat and an overnight cruise to Isabela Island, to make landfall, we had to wake up another G sea lion. Another delicacy is the Galapago land iguana, this was the first one sighted in over 6 years on this side of the island, so we left it alone. Not many insects on the island other than these big locust and their primary predator, the lava lizard. Most of the islands are very dry for a majority of the year with few flowers. The only pollinater is the Galapagos carpenter bee. Then in the water for some snorkeling, I was a bit surprised to come face to face with a non-sleeping sea lion. "I love boobies!" was heard over and over again when we ran into the Galapagos blue-footed booby. The one on the right has got a leg-iron. .....but if you get on the edge of their swimming pool and bark like a sea lion, they'll come right up to you and say hello......not my fault that they like me. Do you call this a school or a flock of penguins? Back to the boat for lunch, then to land in the afternoon to check out the land iguanas and more giant tortoises. In the afternoon, a visit to a more unhospitable side of Santiago where only the tough survive. After a walk on the lava fields, most went for a swim, I regret that I did not brave the cool water and see what was down there. Wow, I really missed it. And finally, riding that turtle!